Laura Lesky Blevins, owner, has been riding since the age of six and cared for her own horse since the age of nine. 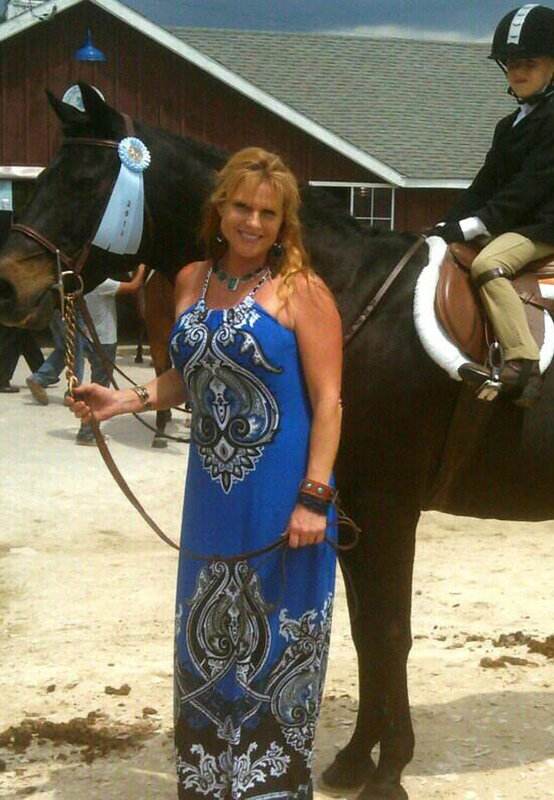 She is an award winning rider and trainer, qualified in hunt seat equitation, basic dressage, and equine management. She has earned many riding awards including the 1992 Adult Equitation Championship for the Chester County, PA Horse Show Association Series. Prior to opening the Deer Antler Stables, she taught in West Grove, PA and at the University of Delaware in the Equine Studies Department while earning a BS in Animal Science. She opened the Deer Antler Equestrian Center in Clayton in 1999 and expanded to a Middletown facility from 2002 to 2008. In August of 2008 she consolidated all services back to the Clayton stable. Sarah started riding at the age of 8 in Northern Virginia. After moving to Wilmington with her family, Sarah graduated from University of Delaware with a degree in psychology and several years’ experience teaching preschool. She then re-immersed herself in riding at Carousel Park. In 2002, Sarah moved to Clayton and began riding and working at Deer Antler Equestrian Center. She has competed in a number of horse shows with Deer Antler, winning many championships in Adult Equitation, Hunter, and Pleasure divisions. Having started teaching lessons at Deer Antler in 2003, she continues to enjoy the opportunity to share her love of horses with the students there; she is especially proud to have passed on and thoroughly nurtured that love in her daughter, Kaia. Now a University of Delaware employee, she keeps herself extra busy with her family, their love of baseball, her various crafts, working in her church’s children’s ministry, and, of course, regular barn time. When Kristin was 8 years old her parents got her horseback riding lessons for her birthday, and her love for horses grew from there. She started volunteering at summer camp in 2007 and was a summer camp instructor from 2013-2015. In the summer of 2015, she started teaching weekly lessons. She graduated from the University of Delaware in 2015 with a Bachelors of Science in Exercise Science and a double minor in Coaching and Strength & Conditioning. In October of 2015 she started working for CardioKinetics and currently manages the fitness center at Newark Senior Center, creating exercise programs for members and helping them to reach their fitness goals. Ashley has been riding at Deer Antler since she was 8 years old. She has been trained in equitation and hunter jumper. She also has shown for years and has won many champion ribbons. Ashley fell in love with the equine world so much that she is now in college for a degree in Equine Studies at Cecil College. Ally started riding when she was 11 years old at a small barn in Bethpage, NY. She showed locally with her trainer on Long Island for a few years until she joined Oneonta State's equestrian team In 2007. She competed in the IHSA circuit from 2007 to 2011. She started riding at Deer Antler in 2013 after she moved from NY to DE. She graduated with a degree in family and consumer sciences education, and pursued her masters in special education. She taught therapeutic riding lessons for a bit before deciding to go back to school for her autism certificate. She is hoping to purchase her first horse in the near future! The staff keeps current by attending seminars and clinics, including some given by US Olympic Equestrian Team coach, George H. Morris, and Olympic riders, Ann Kurzinski and Michael Matz. Staff members are trained in First Aid and CPR. Junior counselors assist with camps. Kayla Smith and Angie Colvin are our experienced employees that help Laura with providing daily care and nutrition for the horses. Rich Guelette, Wyatt Blevins, and Tom Johnson will be seen around the farm with their amazing maintenance and repair skills. We'd also like to thank our wonderful farm and camp volunteers!